"Students who made it to high school or college before failing out of school had a difficult time finding a husband or wife when they came back to the village. Villagers believed that people who hadn't grown up doing farm work as children wouldn't be able to handle all the work as adults and would probably screw it up anyway. No one wanted to arrange a marriage with someone like that" - Kunsang Dolma describing Tibet in 1990s in her book, "A Hundred Thousand White Stones." It’s unknown if this belief system still remains strong in Tibet. However, this has been definitely not true in Tibetan Diaspora in India and Nepal. In the 1970s and 1980s in Diaspora, Tibetans enrolled in Indian Army were considered as a preferred spouse in the Tibetan settlements in South India. You will hear a lot of stories about how these armies spent their vacation in Tibetan settlements with a stack of cash (such as several 100 and 500 bills placed in the front pocket of a transparent shirt) and displayable assets including Western watches and latest radio and cassette player. Many eligible women seems to fall for these young and seemingly economically viable army men. Similarly, though very less in number, many also preferred those who were working in Tibetan institutions particularly in the Tibetan government in Exile. For instance, many government officials working in different Tibetan settlements in India and Nepal have married someone from these settlements. Also, there were a good number of incidents where some parents in these settlements have come to meet a visiting Tibetan government official with the hope of finding an educated and employed husband for their daughter. (Note: I am sharing incidents, stories, snippets and facts that I experienced as a Tibetan men). However, since the re-settlement of Tibetans in the United States in early 1990s, the status of preferred spouse has shifted from Indian army or Tibetan officials to those in the West. Now, in general, any matrimonial offers that come from the West are unquestionably accepted. No questions are ever asked on the economic capacity of petitioning spouse who lives in the West. No questions are directed towards the age, prior marriages, current religious affiliation, past backgrounds and other inquiries that were typically made in the past. Nothing matters (even spouses) when it comes to securing an easy route to a life in the West. In this present time, the meaning as well as purpose of preferred spouses has changed to a level where it is too complicated to draw a fine line. Once the spouse reaches the West, s/he start to realize that his/her preferred spouse is not the one s/he wants to live with for life. Hence, there are increasing number of divorces in the United States. 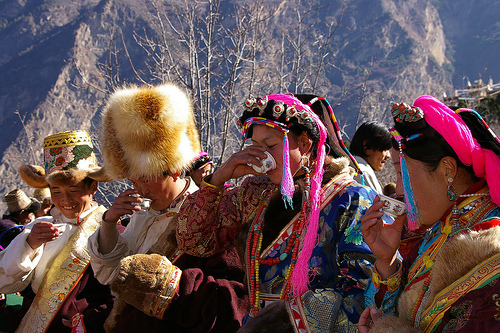 The latest change in preferred spouses has impacted the Tibetan culture of family the most. And this will continue to impact with the ongoing expansion of Tibetan population in the West.